A new report by my colleague Steven Camarota finds that most immigrant households use welfare. That immigrants receive taxpayer-funded benefits at higher rates than the native-born isn’t a new finding. But previous research (including by CIS) has never found such a high rate. The reason is that Camarota used a different Census Bureau data source, the Survey of Income and Program Participation (SIPP), that is more difficult to use but, as its name suggests, provides the most comprehensive view of welfare use (a.k.a “program participation”). The study shows that 51 percent of immigrant-headed households use at least one welfare program, as opposed to 30 percent for households headed by the native-born. The study examined Medicaid, cash assistance, food aid, and housing programs. 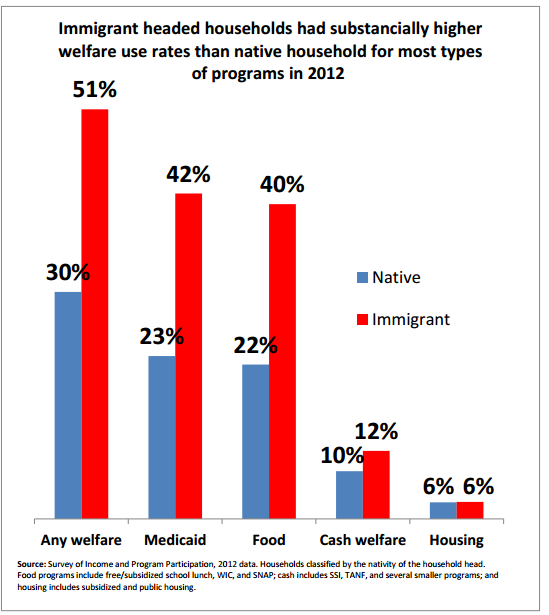 The graph below shows overall welfare use for immigrant and native households. But it’s only illegals! Actually, three-fourths of the immigrant households using welfare are headed by a legal immigrant. Illegal aliens are indeed included in the SIPP, and they do often receive welfare benefits on behalf of U.S.-born children, but this is not a problem that can be solved simply with a fence, a wall, or any other form of enforcement. But immigrants are hard workers! No doubt, but welfare and work are not mutually exclusive. The report found that half of immigrant households with one or more workers still accessed the welfare system. Among those working-households headed by an immigrant who did not have a high school education, an astonishing 77 percent accessed welfare, as did 64 percent of working households headed by an immigrant with only a high school education. This is because the entire welfare system is designed to help low-wage workers, especially those with children, and this describes a very large share of immigrant households. For example, a household consisting of a mother with two kids working full-time earning $12 a hour is still eligible for just about every welfare program. It’s for the children! As the preceding suggests, much of welfare is intended to benefit kids; that’s the main way that illegal immigrants, in particular, receive welfare benefits. Fully 62 percent of immigrant households that have children feed those children, at least at school, with taxpayer money. One might ask why are we admitting people – hundreds of thousands more every year – who can’t even afford to feed their own children? But immigration-booster Linda Chavez, who commented on our study in today’s USA Today story, predictably responded with the liberal argument that welfare is an investment: “These kids who get subsidized school lunches today will go on to graduate high school…will go on to college and move up to the middle class of America.” Well, then, the more investment the better! Let’s give everyone welfare! And anyway, even if you don’t count free and subsidized school lunch, welfare use is still at 46 percent for immigrant households. #share#It’s only recent immigrants! Linda also tried this retort in the USA Today story, saying, in the reporter’s words, that “immigrants start off poorer and have lower levels of education, making it unfair to compare their welfare use to the long-established native-born population.” Even though she was provided a copy of the report for comment, it appears she didn’t get to the second bullet on the first page, which notes that even among households headed by an immigrant who’s been here more than twenty years, about half use welfare. Let’s wall off the welfare system! Good luck with that. We tried that in the 1996 welfare reform, and the results of that social experiment are in. The broader welfare reform measures really did work, but the attempt at differentiating between poor people based on place of birth didn’t. There’s a short appendix at the end of our new welfare report, starting on page 25, which explains why. It’s enlightening reading for those who think subtly calibrated policies negotiated in Congress can be successfully implemented if they go against the grain of liberal bureaucracies. Some of the highlights: While immigrants in theory can be deported for becoming a “public charge,” it never happens; in all of 2012 there was just one investigation of an immigrant under this provision, and it was dropped. In figuring who is a “public charge,” only cash benefits are counted; so that an immigrant family living in public housing, receiving food stamps, free school lunch, and Medicaid is considered self-sufficient! The requirement that new legal immigrants turn to their sponsors if they need help, not the welfare system – “deeming” in the jargon – contains an “indigent exception”; in other words, if you’re poor enough the welfare bar doesn’t apply, negating the entire purpose of the bar. #related#The restrictions on immigrant welfare use also don’t work as intended because they apply only to a modest share of immigrants; some programs aren’t restricted; state governments often cover immigrants with their own money; there are numerous exceptions and exemptions; and some provisions are simply unenforced. Practically and politically, it’s nearly impossible to keep poor immigrant families off the welfare system once they are in the country. This isn’t a moral failing; the fact that immigrant households are about 60 percent more likely to use welfare than natives doesn’t mean they’re 60 percent “worse.” Rather, they’re less educated, thus earn less money, thus qualify for a wide variety of taxpayer-funded services. There’s simply no way to allow less-educated workers into the country to fill low-wage jobs without creating enormous welfare costs for taxpayers. The only answer is to stop admitting so many poor immigrants. When you’re in a hole, stop digging.